Overcast. Low 39F. Winds light and variable..
Overcast. Low 39F. Winds light and variable. During St. Francis Medical Center’s first decade of operation, its emergency department’s patient volume increased 50 percent, requiring not only a larger department, but also more efficient methods for treating the increasing influx of patients. 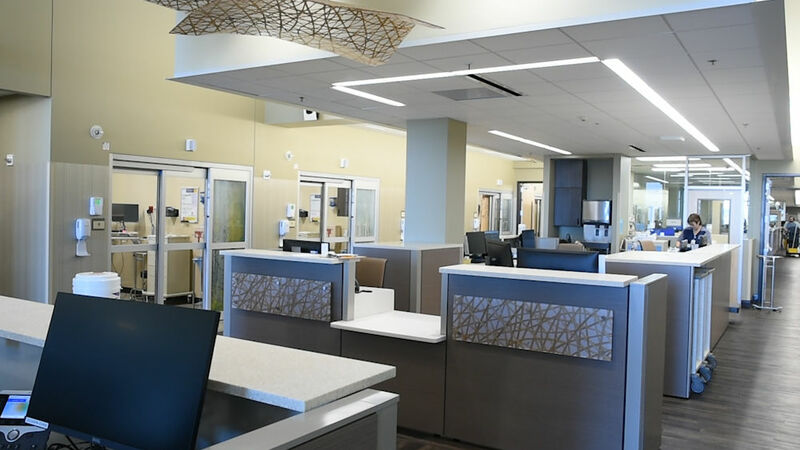 The all-new ED opened Feb. 13, upgrading the former department’s one triage room and 23 exam rooms to four triage rooms, six “super track” rooms, 38 exam rooms and four behavioral health rooms. Many people have experienced the frustration of being rushed to an emergency department, only to spend hours in the waiting room before being seen. This is simply because traditionally, emergency departments prioritize the most serious cases. For example, patients having a heart attack are seen immediately, whereas those with an injured ankle typically have to wait. St. Francis Medical Center’s new emergency department tackles this issue by using a system called “split flow,” which employs the aforementioned super track rooms. 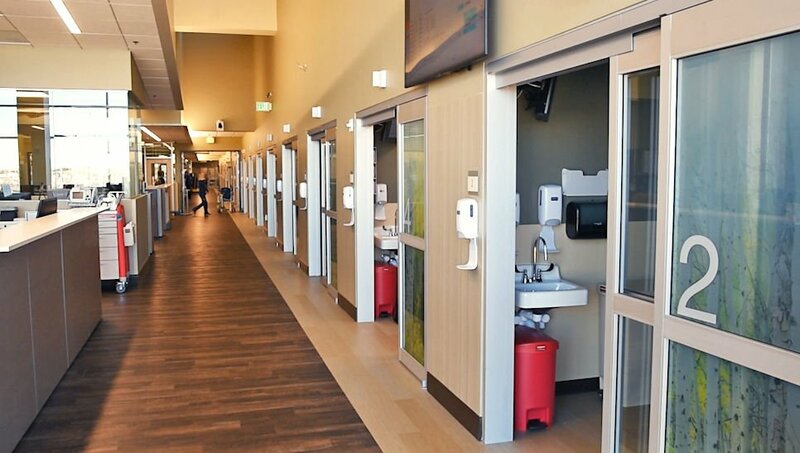 In this system, patients with more acute needs flow to exam rooms to receive the appropriate care, while patients with lower-acuity complaints like cold symptoms, dental pain, earache, pinkeye or flulike symptoms are simultaneously treated in the super track rooms. “That super track area is for patients who have a lower-level complaint. Like, ‘I’ve twisted my ankle,’ ‘I need some stitches,’ just something that we can take care of quickly for you, and we don’t want to get you in the mix of those patients that will have longer lengths of stay because they’re sicker and need more care,” said Emergency Services Director Michele Hobbs. Super track areas are a relatively recent concept in the industry. Another part of that increased efficiency stems from the fact that the system also allows physicians to multitask, by treating super track patients while waiting on results for more seriously ill or injured patients. Studies have shown that the split flow model significantly reduces wait time and length of stay prior to discharge for ED patients compared to the traditional model. ER doctor Chris Johnson, MD said the increased number of rooms also helps to limit the wait time for patients. “We’ve more than doubled the bed space we have, which means less time in the waiting room,” he said. Dr. Johnson also detailed why it’s preferable to take an ambulance rather than driving yourself to the ER. “The advantage with [dialing] 911 over just coming in by yourself, is they initiate treatment in the field. So it’s more than just transportation and getting here quickly, there are actually interventions, medications, procedures and things that paramedics and EMS can do to start treatment there at your door,” he said. In fact, St. Francis Medical Center treats 12,000 kids per year, and the new emergency department reflects that with greatly improved accommodations for them. They now have a dedicated area for children, with a more comfortable atmosphere than their everyday exam rooms, and it’s purposefully placed at the opposite end of the department from the behavioral health unit and resuscitation rooms. They also have an on-staff child life behavioral specialist to help take care of your child so the experience is not as scary for them. “We know that when kids come to the emergency room, everything they see can be scary and traumatic, and we don’t want that experience,” said Hobbs.